In the last couple of weeks I was inspired to start spinning again. 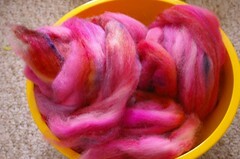 I saw such beautifulness being spun up that I knew I just had to start spinning some of my stash. It was just the kick in the pants I needed to get me to reach my spinning goal for this month. 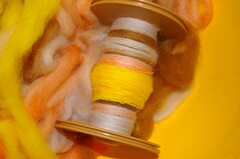 The roving was dyed in big chunks of silver, yellow, orange and brown. I just loved the retro look of these colors together. 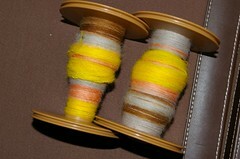 The singles were plied together and have already gotten their bath and the yarn is all ready for a photo shoot. Sadly, you’re just going to have to wait since the yarn was packed away* and I wont be able to take a picture of it until next week. Until then I’ll just show you the yarn I spun up right after finishing spinning the yarn above. This is 4oz of BFL from A Piece of Vermont in the color Waltzing Matilda. Ever since I started spinning I’ve been spinning this really thin yarn and this time I wanted to try something a bit different by trying to get a thicker yarn. 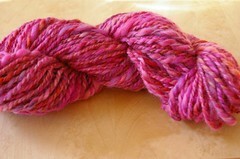 In a couple of hours I had spun up a very pretty thick and thin yarn pretty much like I wanted. This is it, all spun up. This skein is aproximately 86 yards of mostly chunky yarn with some thinner spots. I’m really liking the bounciness of the yarn. Also, it is super soft and I’m sure I could knit a nice hat or neck warmer with it. I’m thrilled to be spinning again and I hope to be able to keep on spinning like this every month. 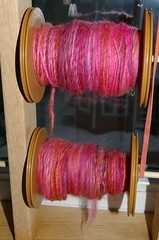 Also, I’d really like to teach myself to Navajo ply so that’s up next on my spinning agenda. If you look to the right of this column, under the calendar, there is a page named: “Currently Spinning”. There you’ll find more info about the yarns I spun up. * Next weekend we’ll be moving out of our current appartment and moving to a bigger place closer to Boston. I packed all my yarn away this morning and the boxes have been moved to a storage unit awaiting the big move. I realised only once the box was gone that I hadn’t taken a picture of my yarn! We’ve already moved out a lot of stuff but there’s still tons to do! Guess what I’ll be doing this Martin Luther King Day! Your yarn is beautiful! Good luck with your move. Oh, that pink is fun! Hope the move goes smoothly. That pink yarn is gorgeous, and I can’t wait to see what the Perchance to Knit yarn looked like once it was plied and done. But I’ll be patient – sounds like you’ll be very busy. Good luck with the move! Beautifal spinning – good luck with the move! Love the new look! Hope the move goes well. Does closer to Boston mean we’ll see you every now and then at the Brookline SNB?? Closer to Boston!!!!!! 😉 That is certainly great news. Best wishes with the move. Best of luck on the move. Your photos on Flickr looked fabulous.